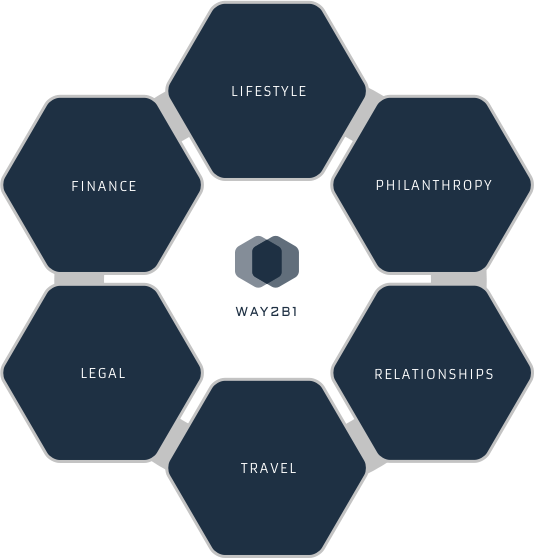 Way2B1 is a platform that makes sense of integral data used by individuals and families with complex lives. Our mission is to build applications that make our users' lives more enjoyable, efficient, private, and secure. Greenlight gives back control of key decisions to the family by effortlessly gathering consensus and feedback on purchases, investments, and philanthropic requests. Way2B1 is a platform and a network that allows individuals, families, and their support systems to connect every facet of their lives seamlessly and with flawless execution. Our mission is to unify the disparate information that a family depends upon and give back control of key decisions to the family and their support, securely and with privacy. By connecting to information from its source, Way2B1 reduces the opportunity for error and delivers information in real time. The platform currently includes domain focused applications that take the pain out of travel, financial controls, housekeeping and maintenance. Augmenting the technology platform is Way2B1’s privacy conscious network, Grapevine, which introduces families to the world’s elite service providers and philanthropic efforts and allows sharing of wisdom, artwork, and even use of vacation properties amongst family offices with strong relationships. 2016 WAY2B1®. All rights reserved.